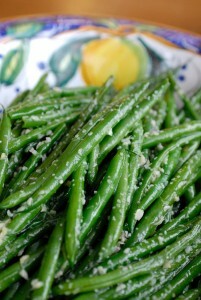 Boost Your Health with Zesty Green Beans! Blanched green beans retain their nutrients and crisp texture while the ginger and garlic give enough zing to keep things interesting! This recipe is a perfect accompaniment to any entree, or a great snack between meals. Aromatic and flavorful, this delicious vegetarian side dish offers some surprising cancer fighting properties. Carotenoids in green beans are thought to reduce the risk of breast cancer. Ginger may enhance anti-tumor activities and suppress tumor growth. Plus, use of garlic in meals has been linked to a reduced risk of certain cancers, so eat up! 1. Bring a large pot of salted water to a boil, and fill a large bowl with ice water. 2. Working in two batches, boil beans until just tender but still crisp and bright green. Start testing after four minutes or so, being careful not to overcook. 3. When done, plunge beans into ice water to stop cooking, lift out immediately when cool and drain on towels. The recipe can be made to this point up to a day in advance and kept refrigerated, wrapped in paper towels. 4. When ready to cook, heat 2 tablespoons oil in a wide skillet over high heat. 5. Add half the beans, half the ginger and half the garlic, and cook, stirring and tossing constantly, until beans are heated through and ginger and garlic are softened and aromatic. 6. Sprinkle with salt, and remove to a serving dish. 7. Repeat with remaining oil, beans, ginger and garlic.